folly and to acquire sensible habits. 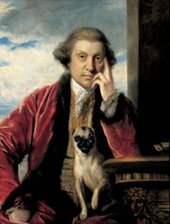 Boswell is best known as the author of The Life of Samuel Johnson 1791. 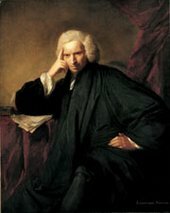 Born in Scotland, and having trained initially as a lawyer, he stayed in London in 1762–3 and decided to become a writer. He met Samuel Johnson in 1763. His London journal shows his determination to sample all the delights of life in the capital, which he visited frequently, spending much time with Johnson. Reynolds got to know Boswell in the early 1770s, though they did not become especially close until after Johnson’s death in 1784. Burke is an extraordinary man. His stream of mind is perpetual. Burke was a statesman and writer, born and educated in Dublin. Reynolds met him soon after the publication of his Philosophical Enquiry into the Origin of Our Ideas of the Sublime and Beautiful in 1757. The two were close friends for thirty-five years, Burke strongly influencing Reynolds’s views on society and politics. In the 1780s Burke became the leader of the Whig group supporting Charles James Fox, and strongly opposed to the war against revolutionary America. He published the hugely influential Reflections on the Revolution in France in 1790, decrying the effects of the revolution. her Grace, with all the dignity of a young Duchess is determined to keep the field, for her feathers increase in enormity in proportion to the public intimation she receives of the absurdity. Her head was a wonderful exhibition on Saturday night at the Opera. One of the most celebrated aristocratic women of her day, Georgiana was a leader of fashionable society. She became mired in controversy during the 1784 election, when she campaigned on the London streets for the Whig politician Charles James Fox. This grave trans- gression of traditional gender boundaries made her the subject of vitriolic criticism in the press and satirical prints. It was impossible to be dull in her company, as she would ridicule her own foibles rather than want a subject for raillery. Catherine Fisher was one of the most celebrated high-class prostitutes in London. Born to working-class parents, she was by the late 1750s supported by a number of aristocrats and gentlemen. Soon ‘Fishermania’ swept the capital: young women imitated her clothing, journalists wrote obscene verses to her in the press, and her image was plastered all over the print shops. She later married an MP named John Norris and became known for her acts of charity. Fox is a most extraordinary man… who has divided the kingdom with Caesar; so that it was a doubt whether the nation should be ruled by the sceptre of George the Third, or the tongue of Fox. The great political character of his age, Fox was a democratic Whig, an advocate of parliamentary reform and a strenuous opponent of the war with America. He was also an enthusiastic supporter of the French Revolution and a prominent exponent of revolutionary principles throughout the 1790s. A friend and ally of the Prince of Wales, he was a hard-drinking gambler and almost constantly in debt. By the end of the 1790s he had no real political support, and led the opposition into effective retirement. 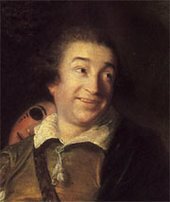 Garrick was the most celebrated British actor of the eighteenth century. He arrived in London in 1737 with Samuel Johnson, and a few years later gained much critical acclaim for his performance as Shakespeare’s Richard III. He soon became the leading figure in the London theatre, as actor, playwright, producer and joint owner of the Drury Lane theatre. Reynolds’s relationship with Garrick was ambivalent. 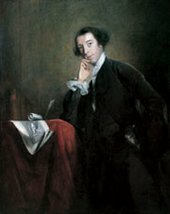 He admired Garrick’s professional achievement, but thought him ‘a slave to his reputation’, caring more about his own name than the welfare of others. Goldsmith had no settled notions upon any subject so he talked always at random. It seemed to be his intention to blurt out whatever was in his mind and see what would become of it. Reynolds got to know Goldsmith in the early 1760s. A prolific writer of poetry, plays and essays, Goldsmith’s recklessness and generosity left him continually in debt. He achieved considerable success with his novel, The Vicar of Wakefield 1766, his poem The Deserted Village 1770, and his comic play She Stoops to Conquer 1773. 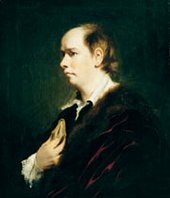 His conversation did not match his literary abilities: as Reynolds observed, ‘many suspected that he was not the author of his own works’. Johnson to be sure has a roughness in his manner: but no man alive has a more tender heart. He has nothing of the bear but his skin. Johnson’s reputation was secured by the publication of his Dictionary of the English Language in 1755. He became a close friend of Reynolds, who said he had ‘formed my mind’. 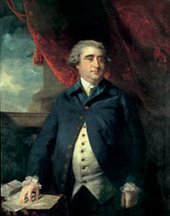 Johnson was a fervent Tory, and the two grew more distant as Reynolds gravitated towards the Whig politician Charles James Fox. 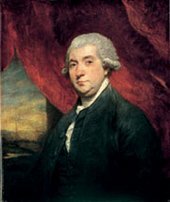 Johnson’s reputation rests not only on his publications, including The Lives of the English Poets 1779-81, but also on Boswell’s descriptions of his eccentricities, brilliant conversation and opinionated outbursts, especially against the Scots. His manners are so extremely graceful… that you would have thought he came from some foreign court. ‘Omai’ was a young Polynesian man who was brought to England from Tahiti in 1774. 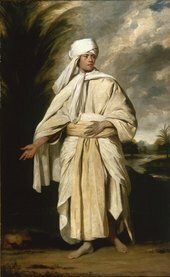 His British patrons, who included the scientist Joseph Banks, wanted to evaluate his responses to ‘civilised’ western society, but Omai quickly became a source of amusement. Omai himself hoped to gain British support against invaders who had taken over his native island, Raiatea. But when Captain Cook returned Omai to the South Sea Islands in 1776 he refused to take him to Raiatea, fearing bloodshed, and settled him on a neighbouring island. He is said to have died there three years later. one of his oddest fancies was a taste for witnessing executions! Selwyn was a politician, wit and gambler, known widely for his interest in devil worship and coffins, corpses and executions. Expelled from Oxford for ‘an irreverent jest’, he became an MP and recipient of several lucrative sinecures which allowed him to indulge fully in his leisure pursuits, including membership of the notorious ‘hellfire club’ which held pseudo-satanic orgies at Medmenham Abbey. In spite of this, he was also regarded as kind and thoughtful, especial towards his adopted daughter, to whom he left his considerable fortune. Sheridan… said trifling was the greatest joy in life, provided that the mind was properly prepared to relish it, by hard study. 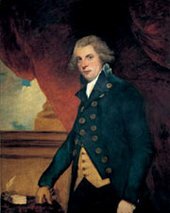 Sheridan, author of The Rivals and The School for Scandal had a successful career in the theatre as a playwright, actor and theatre manager, before entering politics as a member of the Whig party in 1780. 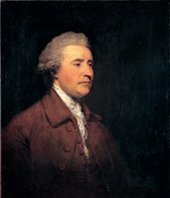 A supporter of Charles James Fox and Edmund Burke, he was also a member of the social circle around the Prince of Wales. In parliament he was considered a great speaker, though in later life the effects of his drinking made him a figure of fun. Power was seated on her brow… She was tragedy personified. 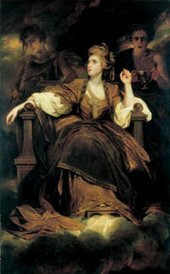 Sarah Siddons was the eldest daughter of a strolling actor-manager, Roger Kemble, and sister of Charles Kemble, who also became a famous actor. 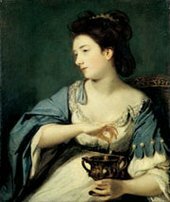 She became celebrated as the greatest tragic actress of her day in 1782 when performing at the Drury Lane theatre owned by Reynolds’s friend Sheridan, and managed to maintain that position until her official retirement in 1812. Particularly known for her interpretation of Shakespearian heroines, especially Lady Macbeth, she became a friend of Reynolds, Johnson, Walpole and many other eminent figures. The man’s head indeed was a little turned before, now topsyturvy with his success and fame. Educated at Cambridge, Sterne took holy orders, living in Yorkshire and earning a reputation as a good country pastor. The publication of the first two volumes of The Life and Opinions of Tristram Shandy in 1760 transformed his fortunes; he came to London to find himself famous. Reynolds painted his portrait and the two became friends. A tour of France and Italy in 1765 provided material for his A Sentimental Journey published in 1768, but he died a few months later. His body was taken by grave robbers, but such was his fame that it was recognised while being used at an anatomy lecture and secretly re-buried. The eldest son of George III and Queen Charlotte, George was a handsome, vain man notorious for his debauched lifestyle. His London palace, Carlton House, was a centre for the group surrounding Charles James Fox, who opposed the ruling Tory ministry. In 1785 the prince married, illegally, a twice-widowed Catholic, Mrs Fitzherbert. This marriage was kept a secret, and in 1795 the prince married, legitimately, Caroline of Brunswick, who brought much-needed wealth to pay off the prince’s ever-mounting debts. He became George IV in 1820.
if everyone shared my opinion of you, you would be the first man, not just in England, but in the universe. That’s not flattery! It is your spirit, only in you are such talents and such extreme goodness united. Walpole was a writer and aesthete, the youngest son of the prime minister Sir Robert Walpole. Educated at Eton and Cambridge, he began collecting during his Grand Tour of Europe. After the death of his father in 1747 he inherited a house in Twickenham which he transformed into a masterpiece of Gothic Revival architecture, Strawberry Hill.